October is National Roller Skating Month and here at Skate Moore in Oklahoma City, we thought it would be fun to give you a little rundown on the history and evolution of skating! Did you know that the first time roller skates were ever seen was all the way back in 1760? That’s over 250 years ago! And while the initial design did not end up working out well at the time, the concept sparked the imagination of inventors across the world! Within 60 years of the original roller skates’ appearance at a masquerade ball in London, skates similar to the ones we ride today were patented… and the rest is history! 1760 – John Joseph Merlin invented the first pair of roller skates. Unfortunately, he didn’t create a way to turn or stop and his invention took him crashing into a wall. 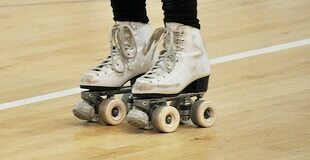 1819 – Roller skates were patented for the first time. 1863 – A skate that finally let people turn and skate around freely (not just in a straight line) was invented in Massachusetts. 1880 – Roller skates were used by men to play “roller polo” which was similar to what we call roller hockey today! 1970 – Skating took off as a fun pastime as roller rinks became more available and easier to maintain because of the use of modern plastic wheels. 1985 – Skating for adults faded out with the era of Disco, but claimed a new following with children ages 5-15. Present – Skating, both inline and traditional quad styles, has remained a family friendly, activity for kids and parents alike all over the world! Roll in For Great Family Fun! At Skate Moore, we’re keeping the tradition of roller skating alive! We offer excellent birthday party packages, open rink time, concessions and way more! If you want to find out more about our party packages, open skating times, or pricing, give us a call today at (405) 794-4644.